Scientists from the School of Agriculture, Policy and Development at the University of Reading have helped provide the expertise behind a major new campaign by environment charity Friends of the Earth. The new campaign, The Bee Cause, was launched amid an avalanche of publicity on 11 April with the charity's campaigners creating an overnight 'guerilla garden' in London to highlight the crisis facing British insect pollinators. New research from Reading provided the hard data for the campaign - including figures suggesting that it would cost the UK £1.8 billion every year to hand-pollinate crops without bees - 20% more than previously thought. 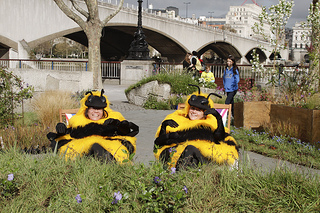 Friends of the Earth created a temporary 150 square metre wildflower meadow in the shadow of the National Theatre, London, to highlight the need for more bee-friendly habitats, with the flowers used to create the spectacle given away to passers-by to encourage gardening that will help bees to thrive. In recent years Britain has lost over half the honey bees kept in managed hives and wild honey bees are nearly extinct. Solitary bees are declining in more than half the areas they've been studied and some species of bumblebee have been lost altogether. Costly hand-pollination is already being used in parts of the world, such as in pear trees in Hanyuan County, China, where native bee populations have been wiped out by a combination of loss of their natural habitat and intensive farming. As part of their campaign, Friends of the Earth is urging the government to protect pollinators by committing to a British bee action plan. The charity is also providing information and resources on how people can help bees in their gardens and communities. Paul De Zylva, nature campaigner at Friends of the Earth said: "Unless we halt the decline in British bees our farmers will have to rely on hand-pollination, sending food prices rocketing. "Bees are responsible for most of our favourite fruit and vegetables so as well as the huge blow to our economy, our diet would also suffer. David Cameron must make the changes needed now to give our bees a fighting chance and save Britain billions." For more details contact Pete Castle at the University of Reading press office on 0118 378 7391 or p.castle@reading.ac.uk.